Ben Einstein, general partner at Bolt, served up this excellent teardown of the Juicero on the company blog. If you were wondering how a juice press could possibly cost $400… well, this is how. Ben Einstein, a product designer and founder at Bolt, a hardware-based VC, recently got his hands on a Juicero press. This desktop juice press that only works with proprietary pouches filled with chopped fruits and vegetables is currently bandied in the tech press as evidence Silicon Valley has gone mad, there is no future in building hardware, and the Internet of Things is a pox on civilization. Hey, at least they got the last one right. This iFixit-style tear down digs into the Juicero mixer in all its gory details. It’s beautiful, it’s a marvel of technology, and given the engineering that went into this machine, it was doomed to fail. Not because it didn’t accomplish the task at hand, but because it does so with a level of engineering overkill that’s delightful to look at but devastating to the production cost. The machine originally cost $700 USD, and the juice packs were purchased through a subscription model for $35 per week. For $2500, you could have all the fresh squeezed juice you want for an entire year. Maybe consumers don’t like the idea of DRM in their food. Juicero was a fantastic success for its creator, as the $100 Million in funding goes to show. For the rest of us, we’re left with a fantastic lesson on when you should engineer less, not more. The Juicero is a machine that is overbuilt, overengineered, and the cost to make this machine prices it out of the market of people who would actually want a desktop juicing machine. In an article that will surely be featured in next year’s Pulitzer nominations, Bloomberg discovered you can simply squeeze these juice bags. 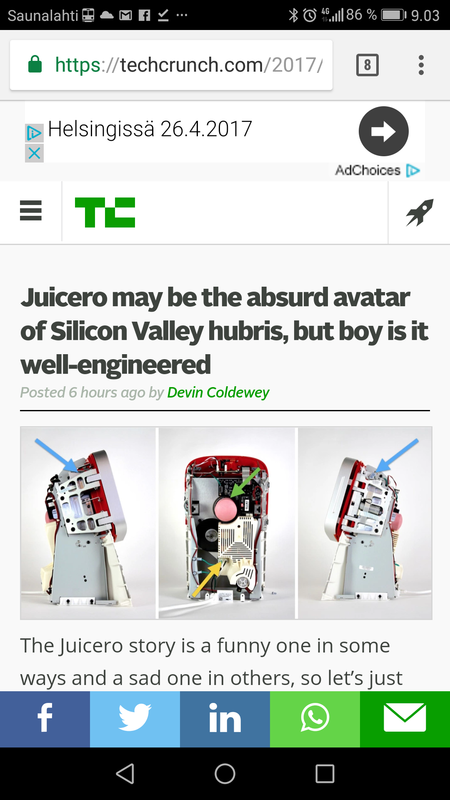 The Juicero isn’t just over-engineered. You could squeeze this bag through rollers with a simpler mechanism to get the same amount of juice out. Last week Bloomberg published an article exposing how easy it is to “hack” Juicero’s produce packs by squeezing them with your hands, deeming the $699 (now $399) WiFi-connected juice press completely unnecessary. Nearly overnight, Juicero has become the posterchild for Silicon Valley excess. Hidden away in Juicero’s bad week of press is one of the most powerful lessons we preach to hardware startups: unconstrained development is lethal. Juicero raised nearly $120M from well-known investors before shipping a single unit. The team spent over two years building an incredibly complex product and the ecosystem to support it. Juicero Inc., the startup behind the $399 internet-connected juice machine, said it’s cutting 25 percent of its staff. The job reductions, which are primarily in sales and marketing, are being made as Juicero is trying to lower the price of its machine and juice packs. The company’s product came under scrutiny in April, when Bloomberg revealed the packs could be squeezed by hand, yielding almost the same amount of juice in a shorter period of time than with the machine. Juicero said after the story in April that it would offer all customers a refund. Dunn wrote in the letter this week that less than 5 percent of owners returned their machines. Big VC firms like Google Ventures and Kleiner Perkins invested $118 million to fund a company that made a $400 machine that squeezed juice out of proprietary juice packets. Now they have nothing to show for it besides over-engineered machines destined for the dump. At least customers are getting a refund! However, today, after selling over a million Produce Packs, we must let you know that we are suspending the sale of the Juicero Press and Produce Packs immediately. , it became clear that creating an effective manufacturing and distribution system for a nationwide customer base requires infrastructure that we cannot achieve on our own as a standalone business.